Responsible owners know their dogs need daily exercise, and a walk provides that for dogs and people alike. 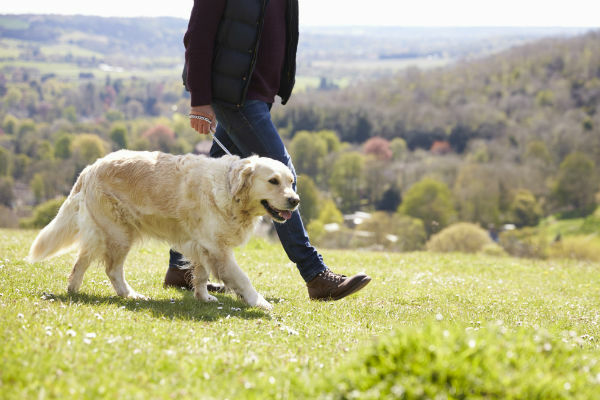 Whether you prefer strolling through your neighborhood or trotting briskly along a trail, loose leash walking is a safe, responsible way to enjoy yourselves. AKC GoodDog Helpline Trainer Erin Rakosky shares two of her favorite exercises for encouraging your dog to walk politely by your side – not pulling ahead, dragging you along on the walk! It’s a nice evening outside, and you and Fido are getting ready to go for a walk. You put your shoes on, get the collar and leash on him, and head out the door. You’re off down the driveway, and Fido immediately starts pulling ahead. You ask yourself, “Who is walking who here?” If this sounds familiar, then it’s time to read further and learn how you can help your dog be the walking partner you have always wanted. The items you will need for training your dog to walk on a loose leash are: a flat, buckle collar; 6 foot leash; and plenty of small treats. Regular harnesses that hook on the back of your dog are not recommended. These types of harnesses can actually encourage your dog to pull harder. If you do want to use a training aid, then the use of a head halter or front hook harness is recommended. 1. Off-leash Work: The first exercise that I like to do is actually with my dog off leash. It is great to do this outside in a fenced in area, but if you do not have access to one, then inside the house, in a hallway, will work too. I first walk around and ignore my dog. Then, I will call them while being very excited. When they come to my side, I will reward them with a small treat. While I continue to walk, I will talk to my dog in an upbeat voice encouraging them to stay at my side. Every couple of steps I will reward my dog with a small treat. After about 10 to 15 steps, I go back to ignoring my dog allowing them go back to whatever they were doing previously. After a minute or two I will call them back and repeat the process. I like this exercise because it gives the dog a chance to take a mental break after working hard with me. By doing this, your dog will soon learn that great things come when they are walking with you at your side. 2. 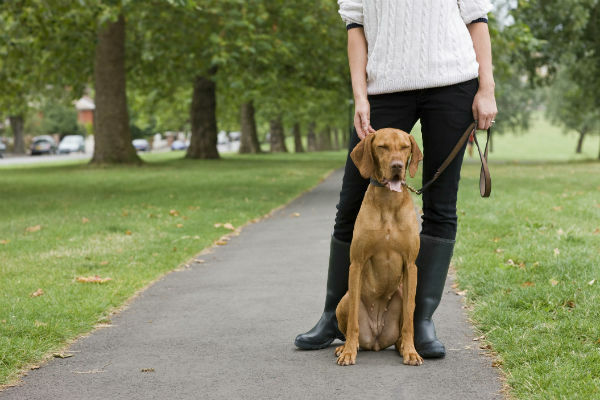 Out on A Walk: The next exercise should be done while you are out on a walk with your dog. When your dog pulls they are doing so because they want to move in the forward direction. So when your dog starts pulling, you should stop and take several steps backwards. While stepping backwards, call your dog in a cheerful voice and reward them when they return to your side. By doing this, you are taking the dog away from the forward direction in which they were trying to go. Start moving forward again. If your dog continues forward at your side then reward them every 3 to 4 steps with a treat. If they begin to pull forward again, repeat the above steps. Your dog will learn that in order to move forward, they must not pull on the leash. As your dog becomes better at this exercise, start increasing the number of steps taken before giving the reward for staying at your side. Once your dog is able to walk politely by your side, continue to reward but do so at random intervals to keep them guessing. Remember that in order for this training method to work, you must do it every time your dog pulls. If they are allowed to pull on some occasions, then it will only confuse them. Enroll in the AKC GoodDog! Helpline to talk to a trainer and develop an individual training plan for your dog. The AKC GoodDog! Helpline is a seven-day-a-week telephone support service staffed by experienced dog trainers. For more advice on walking your dog on a leash, watch the video below. I’d add one suggestion to this excellent advice. I’ve learned that Sasha is highly reactive when walking in our neighborhood, and perfectly calm and polite anywhere else. That tells me her herding instinct shifts into high gear when we’re in “her” territory. If you’ve had similar experiences with your own dog, consider a vigorous round of indoor training before venturing out into the neighborhood. I put Sasha through some Rally Obedience basics and work on sit/stay, down/stay, and a variety of heel and come exercises. That gives her the mental stimulation she needs and releases some of that marvelous Sheltie energy! This entry was posted in American Kennel Club, Dogs!, Home page, Training and tagged AKC, Dogs, loose leash walking, Ozark Summer Highlands Sasha, Shetland Sheepdogs, Training. Bookmark the permalink. German Shorthairs can be a problem whenever they smell game. They can air scent a mile away.